Today I'm sharing a very special guest post. It's written by none other than Cliff Larrew 🙂 He's the dad and husband of The Selling Family! In fact, once you read the post, you'll see exactly how we came to be The Selling Family (and not The Selling Jessica or The Selling Overstressed Mom!!). This story is from Cliff's perspective, but from my point of view, I feel so lucky that I've been able to grow this business with my husband by my side. I mean, how else can you make $12,000 on a date night?! 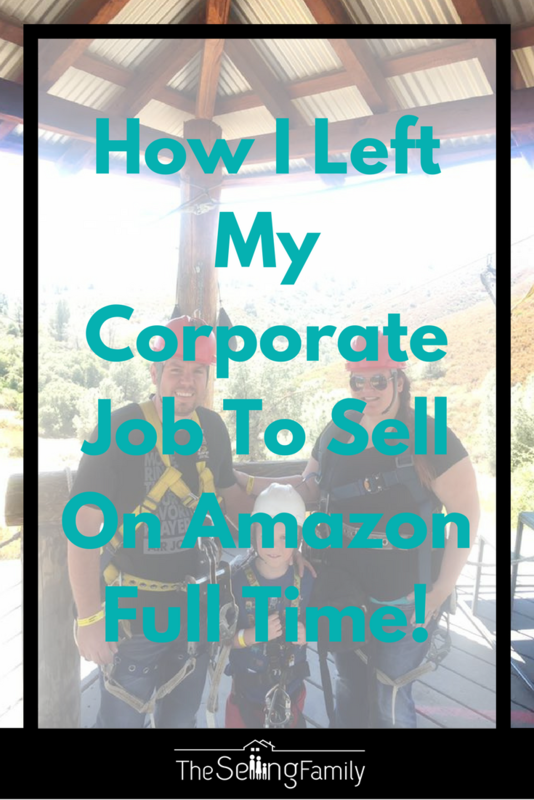 Cliff wanted to share what his experience was like going from a “good” corporate job to selling on Amazon full time. You see, Cliff's story is special, but the circumstances that led to his big decision are far too common. If so, you're not alone. But that doesn't mean you're stuck feeling that way forever!! Cliff and I both hope that this story inspires you wherever you are in your Amazon selling journey. So without further ado…Take it away, Cliff! Working long hours, being underpaid, feeling stressed out, and having a bad boss…This was my life from 2004 to 2011. Maybe some of you can relate to those feelings in your own life. I was working as an Area Manager for an international tile distributor in California. I was responsible for multiple retail stores and over 40 employees prior to the recession in 2008. I enjoyed my job for the most part and enjoyed most of the people that I worked with at the company. I was a young employee and one of the youngest managers in the company. I was putting in 40-60 hours a week and dealing with the daily stresses of dealing with employees, customers, and building problems. The recession in 2008 hit the housing industry very hard and our company was directly connected to the health of the housing market. What followed over the next few years was hard to take in stride. I had to do countless layoffs and firings. Sales for the stores that I was responsible for were shrinking quickly. The stress of deciding which employee to layoff was nauseating at times. My regional manager above me was as cut-throat as they come and to prove it, as you may have known from Jessica’s previous blogs, he let Jessica go from the company. This was a very trying and difficult time for me as I continued on in the company. I was making a decent and reliable salary from the company, but knew I was being underpaid in comparison to other management positions in other fields (and even within the company). With a need to provide for our family, I continued to work and put my best foot forward. At that time with profits dwindling and massive layoffs, the owners were starting to micro-manage the business and it became a very scary time for all the employees. I was continuing to manage while the desire and enjoyment was quickly fading. Soon it became just a means to survive and a big life drain. I wasn’t depressed, just way over stressed. I dreaded my phone ringing. I was scared to answer emails. I was barely allowed to have a day off. I couldn’t enjoy myself in social situations with family and friends because I was worried about what I had to take care of the next day. Worst of all I was missing my newborn son growing up. I wasn’t the same person I had been before, but I pressed on to provide for my family. When Jessica got laid off from the company, it was really hard and I knew she wanted to do something different. I never knew it would be online selling. Over the next couple of years, I would come home from long days and she would be telling me of some of the new things she was going to sell and stuff she wanted to look at selling. All the while I believed it was just a hobby to make a couple extra bucks. As she began to sell more and more and the sales numbers went up and up there was a day I came home from work and I realized that selling was not just a hobby anymore for Jessica, but turning slowly into a profession. One night I came home late and our son was asleep and I walked into Jessica’s office and she was buried in inventory she planned to sell on Amazon. She looked up from her computer and the look of being overwhelmed was all over her face. She was excited about the inventory she had found. I could see a stack of 25 Clorox cleaning wands by the closet and I wanted to help her out so I offered to help label and pack the inventory for her. As I labeled and boxed Jessica began to explain the profit that was going to be made from selling the cleaning wands. That was the first time I ever helped her to sell anything online. I had no idea how selling online would eventually change my life. Could This Be A Full Time Gig For Both Of Us? A couple of years since Jessica had been working from home and taking care of our baby, something changed! In November of 2011 I came home from work feeling really bad. It had been a rough few months at my job. I was literally worrying myself sick. Stress to meet deadlines and sales goals for my stores were taking a toll on me and my boss was becoming more and more unreasonable. He was feeling pressure from the owners and taking it out on the managers below him. I was very unhappy with my work situation. So that night when I came home from work I started to tell Jessica about my day (like I did every day) and she just let me complain to her just to get it all off my chest. But Jessica's response that night to my complaints was different. She said, “I think we can make it without your job”. I could appreciate her enthusiasm, but was reluctant to agree. 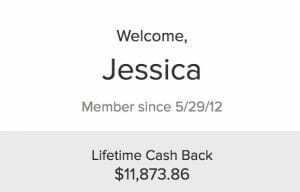 Jessica had been selling on Amazon for over a year and was quickly gaining knowledge of selling items for profit. She knew the potential that was there and she firmly believed we could replace both of our incomes with this new online selling venture. I was hesitant and scared. I had plenty of worries and concerns going through my head. With some long discussions and prayers, on November 7th, 2011 I resigned from my company (giving a two-week notice that would end right before Thanksgiving). I was taking the plunge and diving in. I would officially be a self-employed, online seller! I was relieved to be done with my stressful job. But now I was going from managing 40 employees, to changing diapers all day and taking directions from my determined wife! That was quite the change. Now I am a work from home dad with no more corporate stress. I get to work with my wife, watch my son grow up, and go out and find good inventory to turn into profits. I feel like a modern day treasure hunter. Selling online is definitely not easy by any means, but the opportunity and path it has brought to my life has been priceless to me. It has now been 6 years since turning in my two-week notice, and I can honestly look back and say it was the best decision ever! 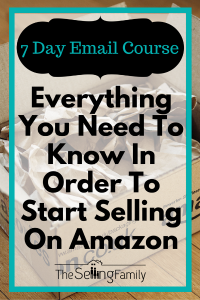 Want to learn how you can start your own Amazon FBA Business? Have you already started selling on Amazon? Let us know in the comments how it has changed your life! I can’t wait to hear about you going Full Time! Hey Jessica, sorry to hear about the financial troubles you are in. The thing with doing Retail Artbitrage is you need to have money available to invest. If you wanted to make $3200 you would need to invest between $3,000-$6,000 in inventory (plus be able to find that much good inventory). This isn’t a business model I recommend when someone needs a quick turnaround like this. Sorry about your illness and glad to hear you are back feeling better. It’s hard to say if you can list those products or not on Amazon. If they are your own products, then you should be able to no problem. Amazon does not have minimum stock amounts. I am nervous to start this but determined. I know it may take me a little longer becauae I’m startinf off with such a little budget. But a seed is small, and it can grow to a mighty oak! Although slow, it will happen!!! Excited to start this! There is nothing wrong with starting small! In fact, we really recommend it. Hi Jay, I wish I had some great advice for when you get home, unfortunately I don’t have any experience with that 🙁 But, may as well make the most out of it while you are here! Well Seth, it sounds like Retail Arbitrage may not be the right fit for you 🙂 It takes both time and money. I get its a big sacrifice, but that’s what it takes to start a business. I am so much inspired from the article especially from your husband’s perspective. In fact, it is interesting to know that many parents want to start a side hustle online. I am not a lone. I know it not a sprint but marathon and gradually, we shall all get to realize our dreams. I will encourage all to press on. We’ve got lots of full-time RVers in our community! I think you will love it. I totally need this in my life. Actually my husband probably needs to read this way more. He is foreman at his company and so completely stressed it’s so unbearable to watch him come home so defeated! 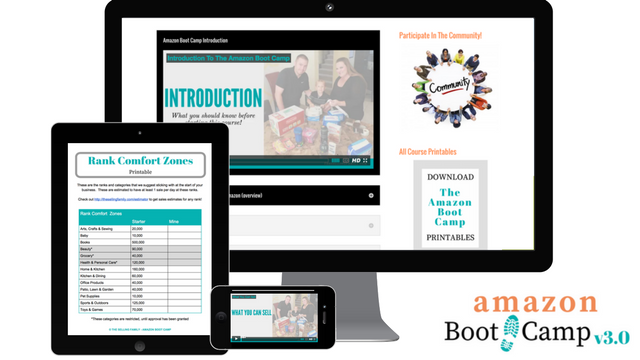 I’m taking your 7 day course right now and I can not wait to jump in!!!! I don’t have experience being in Canada or what differences that would add, but we’ve seen many people replace their incomes while working part time on the business. I have 2 more days at my job!!!! But who’s counting? Haha! ME! Excited to begin Amazon FBA! That is so awesome Susan! Congrats. Good read Cliff! I’m very happy for you and your wife, being able to break the chains of a 9-5 job. I’m super excited to start selling and implementing what I’ve learned from you all. Very inspirational. So wish I’d found what you did, Cliff, when my children’s mom was still my wife. Maybe we’d be together yet. But now my older son is 45 and I’m just starting to gain FBA understanding to set up shop and help him get off his 100% reliance on disability support. At least I’m retired, so that helps stabilize the start up bumps. But it does make financing for the scouting and management tools a challenge. Hi Susan. I know it feels like there is no getting out of the sucky jobs sometimes. My husband felt that! It doesn’t happen overnight, but you will get there. Great inspirational story! We experienced similar success, but in our situation it was me who quit prior to my wife. Lorie came on board about a year and a half later. Congrats! 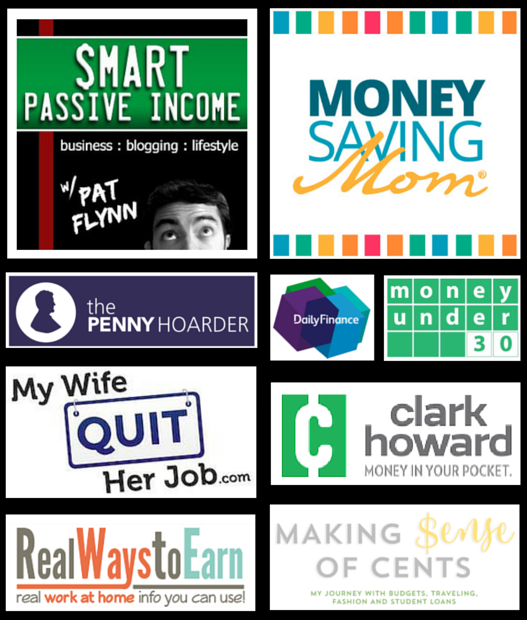 Awesomeness if you don’t mind me asking how much money did you start out making? What kind of items would be the best to make a profit quickly ? Thank you Cliff for your inspiring writing. Been there, done that, doing what Jessica is doing now and haven’t yet been motivated enough to make it to her level. Perhaps the holiday season of 2013 will be my epiphany. Keep changing those diapers and taking direction – it sounds like you are on a winning path to financial freedom. Another great start CLiff, Thanks for share. I’ve been an on line seller since 2008 ,and I absolutely love it. It helps that it’s in my blood because my father, uncles and grandfather were also merchants so it comes natural to me and having 15 years of customer service also plays a big part of my success. Thank you Cliff and Jessica for your inspiring message. I have the same feeling of going home one day and giving the best for my family. I have tried Amazon and eBay but not so successfully yet and still trying searching to succeed. I found this site and download your free ebook to learn , take action and succeed. Cliff and Jessica, I am wondering how a guy like me from Singapore can do it through Amazon. Wow…what a great inspirational story Cliff, thanks for sharing!!! Well done! Thanks for taking the time to do this! It is very inspiring! Awesome post Cliff and Jessica!!! Reminds me of how my husband alastnd started to do FBA last year. We were missionaries and had to suddenly come off the field. How are you doing Amanda? My husband is a pastor and I am about to start my FBA. Oh Cindy I can SOO much relate to your last sentence! My family are the same. At the moment it’s just a few extra pounds hitting my paypal account but it’s slowly growing. When I earn as much online as I do going to work then I think the family’s attitude will change 🙂 That’s a goal by the way. Very inspiring post! I just recently connected with your wife, Jessica, and I am so excited to learn more about how you two operate your business. what a fantastic story! I love seeing dads come home! Congrats you guys – onward and upward! Hey Chester. Happy birthday! For insurance we actually have a group plan set up through our business partnership. It is a bit more than it was when it was through the job, but it’s worth it to be out of there. We do have a high yearly copay. But drs visits are low and well baby check ups are free. That post was very inspirational. Thanks for sharing. Thank you very much for this post. I am currently in the same situation that Cliff was in and have been wanting a change for about 3 years now. Started doing some selling on Amazon for the past 8 months. I hope to reach your status as a work from home enterpeneuer. This was very inspiriational!! Thanks again.